Tracking to Xodus shoes to attack Swissmurdie! 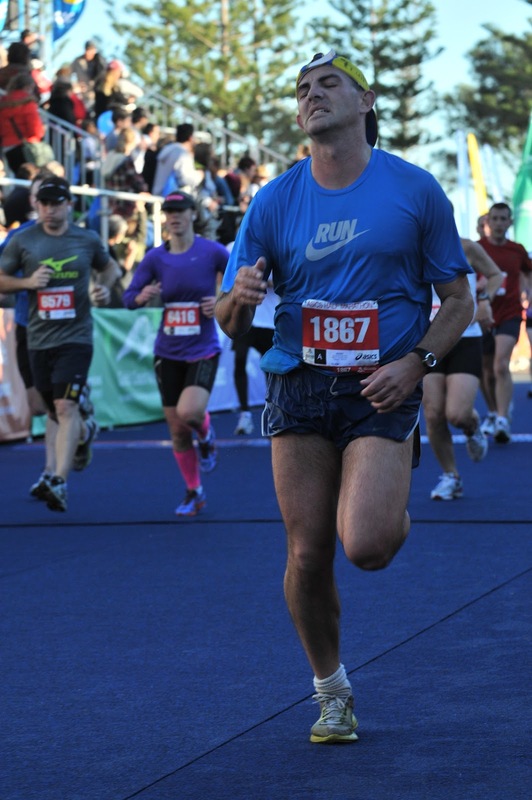 Sunday 1st July Ran the Gold Coast Half Marathon in 1hr 44min 49secs. HR 189 at end (pedal to the metal finishing sprint after stepping up the pace a fair bit with about 400m to go chasing the sub 1.45....) A bunch of my race action photos coming early next week. At the start line in the darkness about 5.55am with our course ahead of us lit up only by the streetlights of the Gold Coast Highway which we were about to run down, the PA fired up with ACDC's epic metal tune THUNDERSTRUCK,Thunderstruck link a very appropriate bit of Australiana which further enhanced my racing mood, and I just knew it was going to be a good day. 244th in age group. 1668th of 9035 finishers 1297th male. Started with aim of holding onto 4.15's with sub 1.30 pacers for 2-5k, and then settling into 4.30-4.40's. Then I was hoping to hold onto 4.30-5.00's, but was consistently drifting back, and losing ground. My hopes for a PB started to fade. Superman aka man of steel hahaha struggling to keep up with me but Melbourne Marathon Man is in front of me. 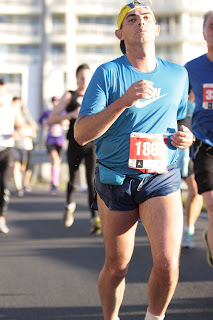 From 14k onwards I could not maintain the intensity and endured the disappointment of seeing the slower 1.40 pacer getting away, and my last hopes for a PB now gone, I knew I was running for something around the 1.42-1.46 mark...leg weary and just trying to hang on until the end. 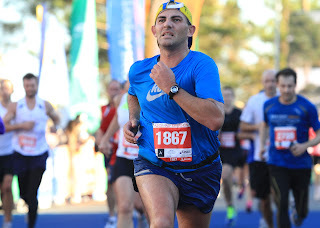 Giving my all pedal to the metal, heart rates in high 180's/low 190's in the last 150m to sneak under the 1.45 mark for the first time since 2006, 6 years ago in the 2006 Fremantle Half. Fantastic sensational day in so many ways. 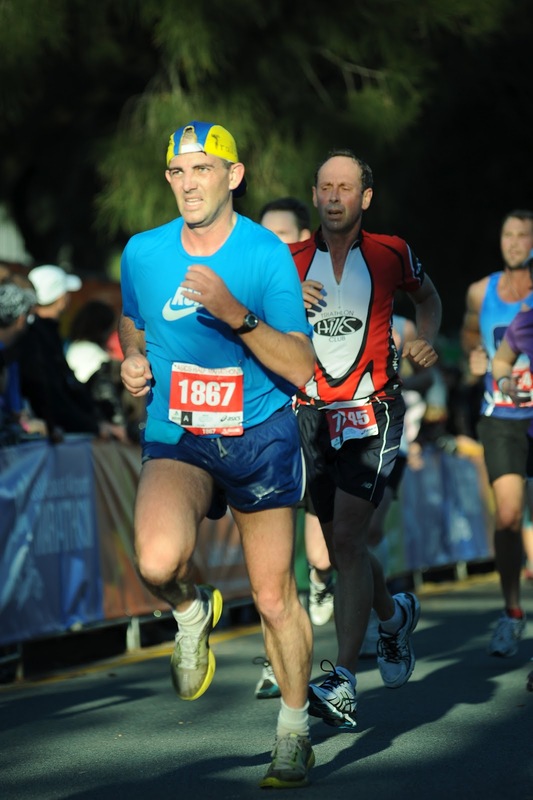 Failed to beat my 2005 1.41.07 Freo PB by 3min 42 secs, but I did just manage to sneak into honourable loss/fail status and vindicate my A-grade status, hit a big 2minute seasons best and my fastest half for 6 years, and 4th fastest ever so far(Freo 2006-1.44, Freo 2003-1.43, and the 1.41 in Freo 2005, the only ones faster, my fastest Perth Half is the 1.45 in 2008, and the 6th best the 1.46 in Bunbury this year, most of my 20-30 half marathons in the last 10 years have been around the 1.47-1.54 mark). So got to be happy with progress. Hearing accadaccas thunderstruck before the start was a highlight for me, guitar work like that is pretty motivating for me at the start of this kind of run....Supernatural kind of surreal day. Memorable! these kind of special moments come along only occasionally, so a lot to thank God for. 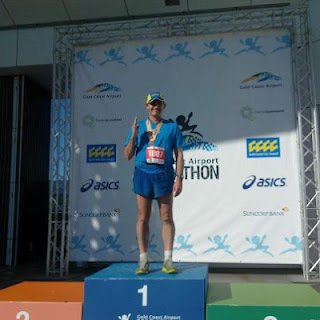 Its a bit of a miracle again I got to be there, but a couple of cashies loans got the $119 flights paid for, splashed out $134 on accomodation for a night 2km from the startline, and spent about $80 on fast food, bus fares etc to survive the weekend. Hope to come back better prepared again in future years if God allows me to...:-) Joyous for sure.!!! A webcast replay of what we saw on the big screen is @ http://webtronwebcast.com/gcam/2012/ ONE HOUR of COVERAGE including expert comments by Michael Shelley (our fastest London Olympics bound runner, and medallist at the 2010 New Delhi Commonwealth Games Marathon). 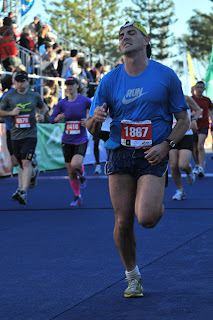 3km splits 13.19/13.59. HR 180. 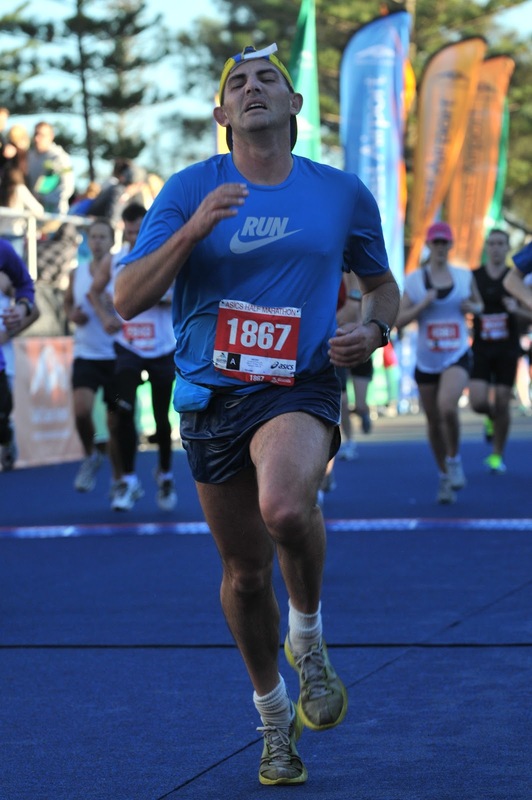 1km splits 4min 01, 26, 52, 51, 30, 38.
not much winds, fairly calm conditions. good workout high intensity. 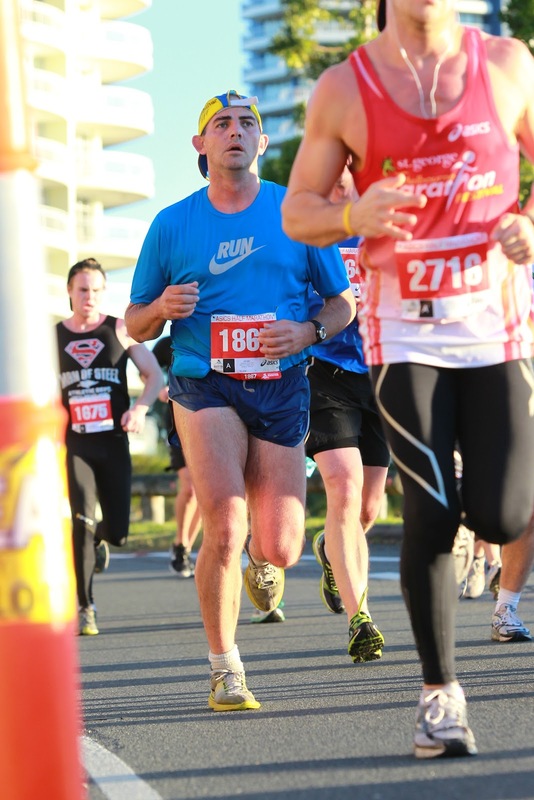 45.30 10k pace, so pretty good. would like to be 2minutes quicker, but not ready yet, but I think I am improving significantly.. no injury issues really. ankle well behaved. raceday is game on. 2x2km intervals 4min rest. HRs 177, 180. Not hugely motivated tonight but I was keen to test out the ankle after 4 days of no run sessions (although I did jog at the park on sunday and across roads at work today. ), and with GC a few days away. Dodgy hammy has been a bit touchy lately too, but only a minor niggle at present. 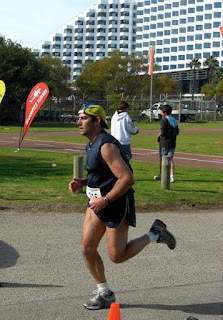 Groin inflammation after some runs also becoming an ongoing niggle but just a minor issue after runs only, not during. roughly 2.7km laps; 15.09/15.10. HR only 129 at end. I got home tonight, and test out my new $9 headlamp on my new hilly local roads course. Great result Jonathon! You notched up some excellent memories there. Fantastic event, although the early start time is a bit of a tester. Having said that, the marathon should start at 6.30 or earlier I reckon. Excellent to be sent off by accadacca - I think being caught up behind the elite/preferred runners may have served you well by pulling back a tad your usual 3:40 or so first km. Sorry I missed you - saw myself at the 9k mark of the webcast and we didn't get back to the finish before the leaders had finished. 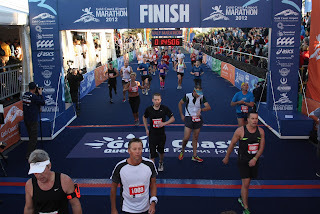 See you next year or in Melbourne - I've entered the half.